We are a British-owned Hong Kong headquartered company from Kowloon, Hong Kong. We are a manufacturer of a full range of legal garments that are hand cut and handmade precisely for you. We have been in business in Hong Kong since 1960, and our tailors, the world�s most global providers of legal wear, have fitters based in Hong Kong, London, Ireland and Australia covering almost all the commonwealth countries. What are your wigs made of? Our wigs are made from the finest horsehair available in the world. We use Mongolian Ponies and Australian Brumbies. The hair used is from a natural process where the animals are not harmed. Once farmed, the hair is cleaned through a sterilization process and is bleached so that it is completely clean and stands up to strict international standards. How long does it take for you to make a wig? Each wig takes up to 1 week to make, and is handmade individually by a single artisan. Our wigs are not produced in a production line, and follow the same production techniques used that have produced Barrister wigs for hundreds of years. Our wigs are designed to keep their shape for a lifetime if cared for well. Being a British owned company, we have developed production techniques that mirror that of the finest wig makers in London. How can you sell your wigs for so cheap? We believe in providing our services for a fair value, and are happy working with a reasonable margin. Being an e-tailor of this item, our costs are very low. We also charge the same price for the same item in all markets. We are the world�s most global supplier of legal wigs with established businesses in UK, Ireland, Australia and Hong Kong. This allows us to continuously produce wigs all year around for the different markets, each that works to their own buying seasons. We can therefore keep our workers producing wigs all year long, rather than in certain seasons when the bulk of wigs are needed, and allow us to benefit from the economies of scale of having a year-round production cycle. What is special about your wig and gown? Our wigs, which are handmade in our workshop in Hong Kong are made with traditional design and British heritage, but being produced at this side of the world has allowed us to do so at economical prices. Hong Kong as you know was formerly a British colony, and so the legal system here is based on the commonwealth system, and so the barristers here wear the same wigs and gowns used by all Barristers. Unfortunately, theft is rampant in the courts, and wigs and gowns go missing on an almost daily basis. Therefore in order to provide better value to you, our price includes FREE monogramming of all wigs and gowns to help deter theft? Why does this deter theft? A would be theft would rather not walk around with someone else�s name sewed into the inside of their wigs and gowns. They would rather steal someone else�s wig and gown which is unnamed and anonymous. Firstly, we can provide you with plenty of references available in ALL countries we deal with by request. We ourselves are British, and have been in business in the UK and Ireland for many years, and have hundreds of Barristers who buy legal items, as well as tailor made suits and shirts. 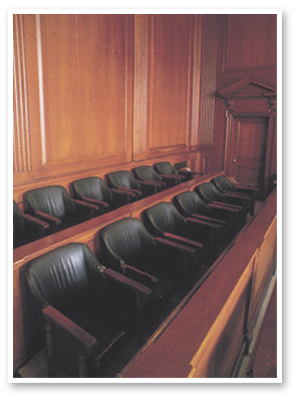 Our clients include numerous prominent QC�s in London, SC�s in Dublin and as well partners in the largest law firms in London and Dublin. Our other web-based competitors on the other hand remain unknown and hide their identity. We also happen to be the most global makers of Legal wear, and have fitters in all commonwealth countries. You can click on our trip schedule above to see our visiting schedule. Some of our web-based competitors are making their wigs of very poor quality. Their wigs are known to look nice, but fall apart in a very quick period of time and are notoriously unreliable, and come from overseas with no warranty. Our legal wigs are designed from the ground up, and made to last a lifetime with proper care and handling. Our company is Hong Kong based, and since we are producing our wigs by ourselves, we are able to offer customizable features on the wig, such as sewing your name on the inside of your wig for security, and sewing your name on the inside of your gown. These features ensure that your items are personalized to deter theft. Do you have different gown choices? No, we make only our gowns from one type of fabric that we find to be the best gown fabric available. We make a lightweight pure wool gown fabric imported from Australia. We have found over the years that this fabric has stood up to be durable and lightweight, and of excellent quality. How long will it take for me to receive my purchased item? All items are hand monogrammed and handmade, so we require at least 10 working days to make and monogram your items. Shipping, which costs US$10.00, takes an additional 5-10 working days. However if you are in urgent need of your items, we can usually accommodate a faster delivery upon request. Please email sales@legaltailor.com and note down your order number and preferred date of delivery, and we will try our best to expedite your orders. Generally, 90% of all requests are honored. Brief bags (Sometimes known as the Blue Bag) are an essential piece of Barrister regalia. 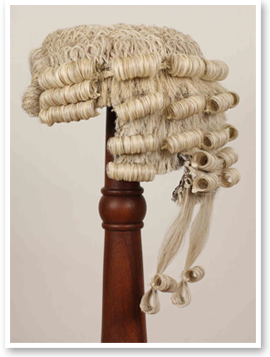 It is a bag usually carried by barristers and usually used to store books, wigs and robes around safely. The bag is usually always monogrammed with the owner�s initials to help identify the bag. You will find almost all established Barristers will own a bag and use them religiously. There are various theories around for the existence of the brief bag. One theory is that an instructing solicitor would place inside a Barrister�s brief bag the fees so that the Barrister would not have to lower himself down to handling the money by himself. Another theory is that the bag is the remainder of a feature on the barrister gown, along with the long thin piece of black cloth that hangs down the front of the robe, and is the remains of what would have originally been a hood attached to the gown, which the wearer would use this to cover his head with to protect him from the weather. Over a period of hundreds of years this use has ceased, and now the bag and fabric is all that is left of this part of the gown. The bag is frequently referred to as a fee bag. The story is that the instructing solicitor would put the barrister's fees into the bag so that the barrister did not have to lower himself to handling the money himself. This is a misnomer. The 'bag', along with the long thin piece of black material that hangs from the front of the robe, is the remnant of what would have been a hood attached to the gown with which the wearer would cover his head to protect him from the elements. Over many centuries this use ceased and what is seen now is what is left of this part of the gown. Please explain to me the features of your bags. Our bags are handmade precisely for you in our workshop in Kowloon, Hong Kong where we produce all of your legal garments. We sew your name neatly on the inside of your bag, and can sew on up to 4 initials. Our bags are made from 100% cotton. For cleaning, we suggest you to dry clean your bag. We also line our bags up on the inside and use a luxurious silk drawstring. The color of the bag for the UK is dark blue with gold colored writing. For the Irish Bar, we make the bag black color with red writing. For members of the Senior Counsel we make a burgundy bag with gold color writing, and for members of the Judiciary we make a dark green bag with gold color writing. We are a supplier of legal regalia to numerous big name companies in the world, particularly in the legal supplies business in Australia, UK and Ireland. If in doubt, you can call us up and speak to John or Andy personally, just keep in mind we are 7 hours ahead of the UK. Moreover, we are a leading maker of custom clothing, and have another website www.hiras.com where our clients can design and order custom made shirts online. We only use Paypal to process your payments, and so you are completely secure in your dealings. We will completely replace any or all items within a period of 28 days from the day you receive your items if there is any defect at no cost (and no return shipping cost to you from us). If you require a different size item, we will also change the size for you within a period of 28 days from receipt of your item, but subject to a small handling and postage charge of �20. to arrange a return authorization number (RNA), and we will provide you with our address in London where you can arrange to return the items. Please also mention the changes you would like in the email. So you sell other legal-related products? 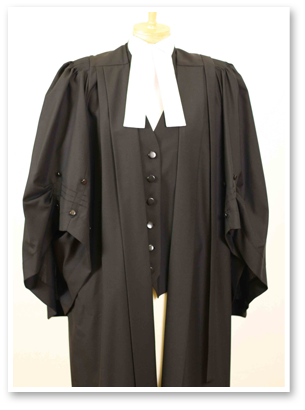 Yes, we offer a complete range of legal products, including all garments worn by Junior and QC Barristers. Our legal wear is entirely hand cut, and handmade precisely for you, which includes personal fittings. A fitter can also visit your chambers, if you choose to. QC Silk robes from a variety of fabrics such as Ottoman silk, lightweight Thai silk, silk wool and more. We make all items at very reasonable prices. If you would like to arrange a fitting, or for more information, please email sales@legaltailor.com. To become part of our mailing lists, please email us at sales@legaltailor.com and we will keep you informed with our progress.